In many developed countries computer technology has already removed numerous obstacles to education and employment for visually impaired individuals. 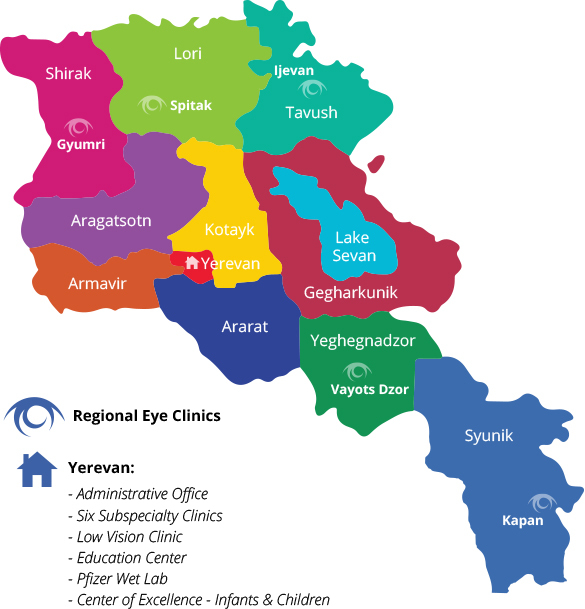 In 2005, the Armenian EyeCare Project opened it Low Vision Clinic—the first and only low vision clinic in the Caucuses. Director, Dr. Lilit Mkrtchyan, did a low vision fellowship in the United States at the Lighthouse Foundation, a leading worldwide center on vision impairment and vision rehabilitation, and the University of Florida. Low Vision is loss of sight that cannot be corrected by ordinary eyeglasses, contact lenses, medication or surgery. A person with low vision should not be confused with blindness. People with low vision have some useful vision, which can often be improved with low vision aids. Low vision can result from a variety of diseases, disorders, and injuries that affect the eye. Many people with low vision have age-related macular degeneration, cataract, glaucoma, or diabetic retinopathy. Age-related macular degeneration accounts for almost 45 percent of all cases of low vision. About 135 million people around the world have low vision. 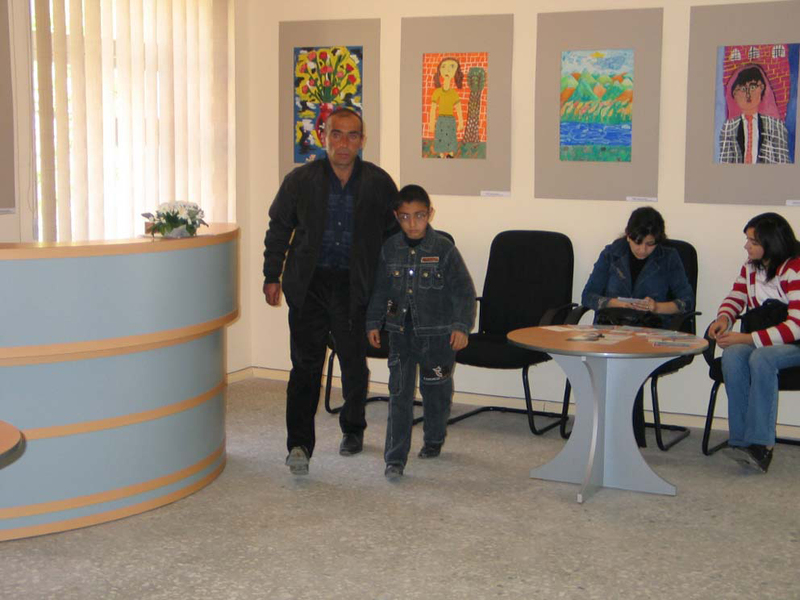 The Computer Training Program is the first initiative of the Armenian EyeCare Project that addresses the need for vocational and life skills training for people with visual impairments. “We believe that this training opportunity will help to raise the self-esteem and confidence of individuals with visual impairments and at the same equip them with the skills necessary to find employment in the future,” said Nune Yeghiazaryan, AECP Country Director. Delivered by a qualified professional teacher from the school for visually impaired children, the two-month training covers a wide range of subjects from processing and data entry to the use of the Internet and more. “For people with visual impairments, the possibility of using a computer is a big step forward in obtaining access to information, learning new skills and gaining computer literacy,” said Lilit Mkrtchyan, Low Vision Center Director. According to Dr. Mkrtchyan, in addition to the Computer Training for adults, over 20 children from School No.14 for the Visually Impaired will have the opportunity to participate in specialized Low Vision training classes. The goal of the training program is to help children with visual impairments to preserve their remaining vision and to get oriented with unfamiliar situations with the help of a walking stick. All of these efforts are aimed at providing visually impaired adults and children with the highest possible level of independence. For individuals in Armenia with visual impairments like Naira, her story below, the AECP Training Program offers a unique opportunity to develop their professional skills, increase their access to various print resources and spend their leisure time in a meaningful and useful way. “I hope that the AECP Program will continue to provide opportunities for more people with visual impairments to participate and learn new skills. I have many non-sighted friends and friends with low vision who can really benefit from this training,” Naira added. Naira Karapetyan, 21, discovers life by reading books transcribed into Braille—a system that enables blind and partially sighted people to read and write through touch. Naira has lost her vision at a very young age and does not remember ever seeing objects, colors or human faces. But according to Naira, thanks to the books she reads, in her imagination the world is full of bright colors and vibrant motion. “My biggest worry is that the literature transcribed into Braille is very limited in Armenia and one day I am going to run out of things to read,” she says with a smile. Naira’s worries were relieved after two months of intensive Computer Training she underwent at the AECP’s Low Vision Center. According to Naira’s computer teacher, Narine Vardanyan, the combination of the right hardware and software, along with the knowledge her students acquire during training, enable the visually impaired people around the world to fully master computer science and to use their skills as typists, office workers and even programmers. In many developed countries computer technology has already removed numerous obstacles to education and employment for visually impaired individuals. Students with visual impairments can complete homework, do research, take tests, and read books along with their sighted classmates. Adults with visual impairments can continue to work and pursue a wide range of careers in mainstream society using computers and other devices.